Emily Tresidder: Just Doing It! Emily Tresidder has her own way of doing things, and she’s been just doing it for years. If you haven’t had a chance to enjoy the Tresidder experience then now is your chance. There’s nothing like it and it can’t be missed. 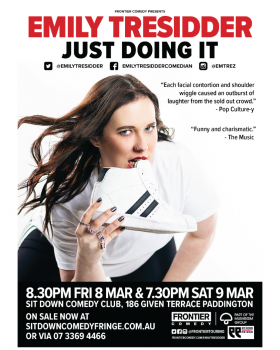 Just Doing It is the fifth solo show for Emily, whose natural ability to engage and entertain has won her fans and glowing reviews at comedy festivals across Australia and the UK. As co-host of the fun, conversational comedy podcast Vic & Em’s Comedy Gems Emily has bantered with guests including Daniel Sloss (SCO), Celia Pacquola and Shane Mauss (USA) – and she’s ready to banter with festival audiences once more! Captivating both audiences in Australia and the UK, Emily is back with another fantastic hour of observational fun, physicality and lots of laughs.